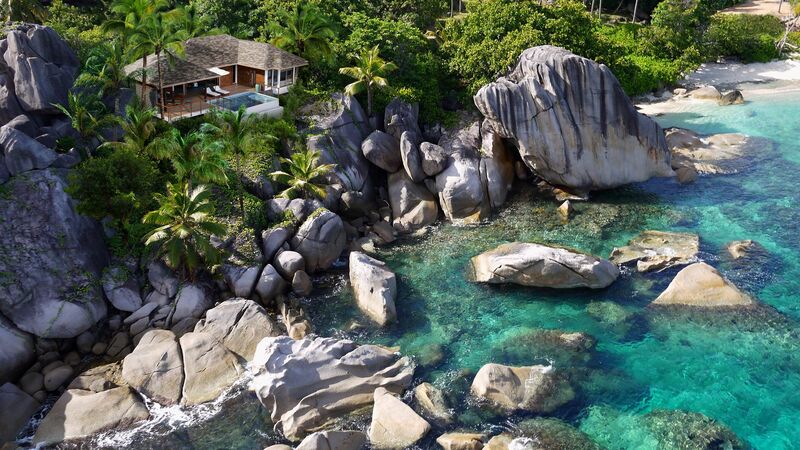 Holidays in Félicité Island take you to a small island hideaway in the Seychelles archipelago, boasting impressive granite rock formations and stunning golden beaches edged by warm, crystal clear waters. It’s the ideal holiday destination for couples and families looking to get away from it all in a tranquil and serene natural paradise. For those seeking a little adventure, treks and trails in the Ramos National Park await, and can be accessed on foot or by bike. Head to the highest peak, at just over 200 metres, for panoramic views of the beautiful islands of the Seychelles. Meet the local wildlife and admire stunning flora and fauna in the glorious nature reserve, where you’ll find a majestic granite boulder backdrop. If you prefer to snorkel and dive, take to the waters and explore the impressive array of marine life in the Seychelles’ underwater world. Surrounded by Inner Islands, Félicité Island is also a superb base for island hopping around the rest of the Seychelles. Luxury holidays in Félicité Island offer you the best of both worlds, with deluxe amenities surrounded by natural beauty with minimum development. Once a coconut plantation, it is the fifth largest in the archipelago and now showcases a patchwork of native fruit trees growing in the wild and offering mangoes, coconuts, vanilla and bananas, as well as being home to snoozing fruit bats. Accessing the island is an adventure in itself, with choices including via helicopter from Mahe or speedboat from Praslin. Allow Sovereign to design a luxury holiday to Félicité Island to match your needs, including airport transfers, deluxe accommodation and complimentary lounge access at a number of UK airports, accompanied by a complete end to end service. The Six Senses Zil Pasyon is an unrivalled sanctuary, comprising spacious villas and residences with their own private pool and wine cellar. Guests can relish in Michelin star quality cuisine and rejuvenating treatments at the delightfully designed spa. Technically, Félicité is an offshoot of La Digue, a sizeable island less than five kilometres south-west. You’ll step off the boat in La Passe, a village with cobbled streets and a yacht-flecked harbour. As long as you don’t mind a few steep climbs, the best way to explore the rest of the island is by bike. The best beaches are just to the south. Anse Source d’Argent is easily the most famous beach in the Seychelles, with its glowing white sands, shallow waters and palm-tree fringe. Alternatively, wheel along to the bay next door or pedal over to Anse Patates; they’re both great for snorkelling, thanks to the clear, turtle-friendly waters. A 20-minute flight takes you from Mahé to Praslin. From here, it's a short boat ride to Félicité Island.